Krikščioniškasis bestiariumas XIII-XV A. Lietuvos kultūroje: Omega segės zoomorfiniais galais (The Christian Bestiary in 13th-15th Century Lithuanian Culture: Penannular Brooches with Zoomorphic Terminals) by Eugenijus Svetikas. This is an amazing work. The author postulates that Zoomorphic penannular brooches, which are a distinctly Baltic style (with over 1000 having been unearthed in Latvia and Lithuania compared to less than 150 in all other locations combined), have been misclassified as belonging to the Pagan Late Iron Age, when, in fact, they begin appearing in great abundance only during the 13th and 14th centuries, after the arrival of warrior monks from Germany in neighboring Livonia (in present-day Latvia). Svetikas argues that the overall form of the brooch represents the Greek letter omega (Ω), well-known as a Christian symbol, and that the zoomorphic terminals refer to specific animals described in Medieval bestiaries to represent Christian virtues. 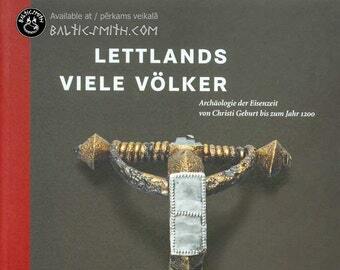 He believes these brooches were manufactured not by the local Baltic inhabitants based on their indigenous beliefs and aesthetics, but, rather, by craftsmen working for the Livonian and Teutonic Orders as an aid in their missionary work of Christianizing the Balts. 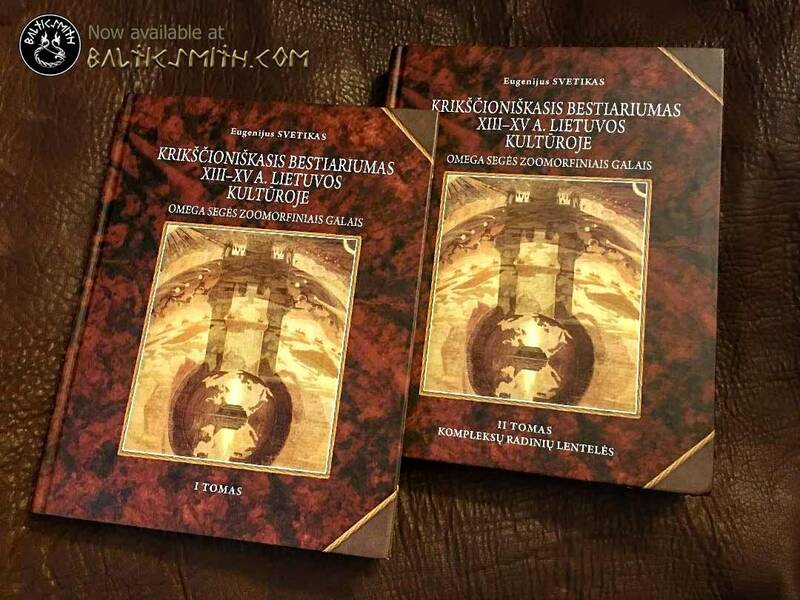 I was able to read only the English summary, so the argument is likely made in more detail in the full Lithuanian text. I have no basis on which to dispute the author's hypothesis, but whatever the conclusion, he has done an amazing service to students of Baltic metalsmithing. He has photographed and classified all known examples of these brooches and presented them grouped by their purported bestiary animal. He also shows many brooches in the context of all the grave goods from the burial in which they were found, and, of course, he gives the full provenance of each brooch. 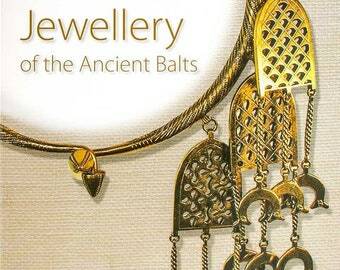 This is a major reference set that needs to be in the library of every enthusiast of traditional early Baltic jewelry. Two volumes totaling 820 pages, over 600 of which are full-page photographic plates. Hardcover. 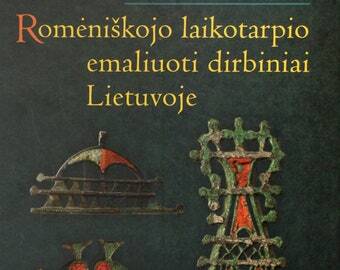 In Lithuanian with summary in English. $100 for ready-to-ship or $50 non-refundable deposit to pre-order from next shipment at same final cost. Very pleased with the calendar I purchased. Accurate description. Prompt delivery. Balticsmith is trustworthy. 2019 Calendar - Ethnic Belts from Latvia. Beautiful rendition of a full sized Baltic axe head artifact. The seller is excellent! I paid for one book and then discovered another, and I was quickly refunded the money saved from combining shipping despite the mistake being mine. Purchases of in-stock items may be cancelled without penalty for a full refund at any time prior to their being packaged for shipping. A fee of $20 will be charged if a stock order is cancelled after being packed but prior to being shipped. Made-to-order items must be cancelled within the first 24 hours of purchase for a full refund, otherwise they will be assessed a 20% fee. Exclusive commissions not made of gold are charged a non-refundable 50% deposit when the order is placed, with the balance due prior to shipping. Any commissions in 18K gold will also require a 50% deposit, but for those, I will refund 80% (I will keep 20% of the total price, which is 40% of the deposit) if you cancel the order. In some cases, Etsy will charge and remit applicable taxes directly, such as 6% MD sales tax for orders shipped to addresses in the State of Maryland, and, as of July 1, 2018, a 10% GST on orders of less than or equal to $1,000 AUD shipped to buyers in Australia. Other states are also instituting plans to collect sales tax on online purchases from out-of-state. I am not familiar with the details of every locality, but any taxes collected by Etsy will be remitted directly to the taxing authority. All other online customers are themselves responsible for any applicable taxes. In-person sales are subject to all applicable national, state, and local taxes, which I will collect and remit to the relevant taxing authorities. I have made every effort to accurately describe my merchandise, including detailed photographs and approximate measurements. I make my work by hand, so sizes may occasionally vary by as much as ±10%. If a stock product turns out not to be what you expected, you may return it within 14 days of receipt with all accessories in as-new condition for a 100% refund of the item price. Made-to-order standard items will be refunded at 80%. Bespoke commissioned works are non-refundable. In either case, insured shipping in both directions will remain your responsibility. If have inadvertently misrepresented an item, I will reimburse the cost of insured shipping in both directions. No claims for lost or damaged return shipments will be considered if they were not insured by you. I carefully pack every shipment myself using multiple layers when appropriate; I even take care to wipe fingerprints off book covers before shipment. Each listing of used merchandise (books) discloses wear and damage in detail, and it is priced accordingly. Occasionally new hardcover books may have slightly bent corners due to the stresses of overseas shipping to me from the publisher. I am working to eliminate this problem, and I will ensure that any book reaches you in the same condition that I received it. All shipments are fully insured and will be adjusted, replaced, or refunded if damaged in transit from me to you. Any claims for damaged merchandise will be considered only after return of merchandise along with all original shipping supplies. Damage to the merchandise must be consistent with damage to the packaging. I have had only two cases of damage out of hundreds of shipments, and that was before recently upgrading to sturdier mailers. I stand behind both my merchandise and my service: I will promptly honor any legitimate claim meeting all the criteria above by your choice of replacement, credit, full or partial refund, or other reasonable remedy. I regularly adjust processing times based on my access to my studio and inventory. Shipping will be delayed if I am traveling. Despite my efforts to ship within the indicated time and to keep my inventory up-to-date on Etsy, an item may be mistakenly listed as in stock when I have sold it in person. In the event of such an oversight, I will notify you immediately and offer you the choice of waiting until I can make or procure more, alternative products, or immediate refund. If an item is not available to be shipped immediately, I will make it for you, which may delay it 1-2 weeks or longer. If rapid shipping is essential for you, please contact me via convo. or e-mail at Andris[at]balticsmith.com prior to placing your order to get an estimated shipping date. I don't want to disappoint you! I promise to deliver by the agreed time for all hard deadlines such as weddings, etc. All domestic (U.S.) orders are shipped insured for their full value. International orders are either insured for their full value up to the limit (currently USD 200, I believe) or registered, which will require a signature at delivery. I will attempt to contact you to authorize signature on receipt if appropriate. If in doubt, and I have not received a timely reply, I may choose to err on the side of caution and indicate signature required. While this slightly increases shipping costs, you are assured that if any shipment fails to reach your door intact, you will be fully compensated. This is important; I once lost several hundred dollars when a seller promised to insure a shipment but failed to do so. I will never subject you to that risk. I ship to U.S. addresses via your choice of USPS first class, priority, or express mail, and media mail when applicable. I will ship to destinations abroad using the most economical and practical means available (usually USPS first class mail international). I charge a modest handling fee of $4 to cover insurance and careful packaging in high quality shipping supplies. Overcharges for multiple items shipped together or items (books) that I am able to ship directly from Latvia to destinations outside the U.S. will be refunded promptly; If you don't see the refund within a few days, please ask. Buyer will be responsible for all brokerage and customs fees for international shipments. Some countries have been known to charge customs duty of as much as 100% of merchandise value plus fees. I declare every shipment at its full value; please don't ask me to do otherwise. If you reside outside the U.S., please familiarize yourself with your local customs policies prior to placing your order. I would love to do custom research, design, and smithing for your special project! If you allow me to add duplicates of your custom product to my line, and I choose to do so, I will charge you only the regular retail price, as if it had already been in my store before I made it for you. Exclusive custom orders as well as those that would not be appropriate to my product line will incur research, development, prototyping (and for multiple units also mold-making) charges. Custom orders may take as little as two weeks or long as several months. I will estimate a completion date upon agreeing to take on the project, and I will commit to firm deadlines such as weddings. I warrant all items made by my own hand to be free of structural defects for as long as I am in business and able to repair or replace them. They should never break under normal use. Please contact me if you have any problem with a product at any time. I will repair or replace any defective item free of charge. Determining "normal use" shall be at my sole discretion. I will quote a reasonable charge for re-sizing finger rings more than 14 days after purchase and for repairs of damage due to daily wear or accident. Minor sub-surface casting defects (typically small cavities) that were not apparent when sold, but which have become visible due to wear are considered merely cosmetic defects and will be repaired for a modest fee. An example of a fully warranted structural defect would be a bubble within a ring shank or pendant bail that causes the shank or bail to break open. Chains, beads, and findings not manufactured by me are subject to limited warranty at my discretion. You simply can't expect to buy everlasting chains and mechanical findings (clasps, etc.) for a few dollars. If you meet me at a fair or show, I do not have the merchandise you want on hand, and you pay in advance, I will ship as soon as possible at no charge. Please contact me via convo or Andris[at]balticsmith.com to discuss wholesale or consignment prices and terms. I take commissions for custom work that involve casting in 18K yellow gold, but not 14K. If necessary, I can contract out casting in any karat or color such as white gold, but that may be more costly. I have found 18K to be not only more attractive, but also more durable, and I am equipped to work with it. I would need to re-tool to avoid contamination in order to cast in 14K. I will fabricate (saw, solder, forge, file, etc.) in any karat or color of gold you desire. 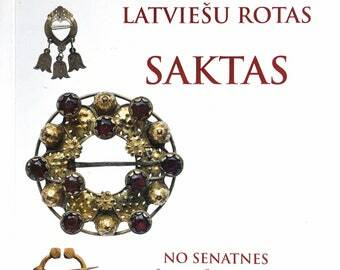 Seno baltu rotas (Jewellery of the Ancient Balts) by Janis Mikāns. SCA. Baltic. Metalsmithing. Replica. Reenactment. Living History. 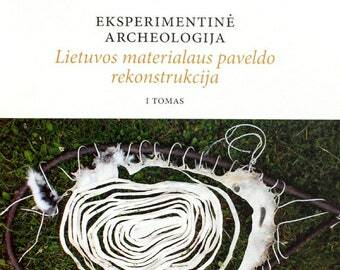 Baltu Māksla / Art of the Balts (English language version of small exhibition catalog). SCA. reenactment. Baltic. metalsmithing.